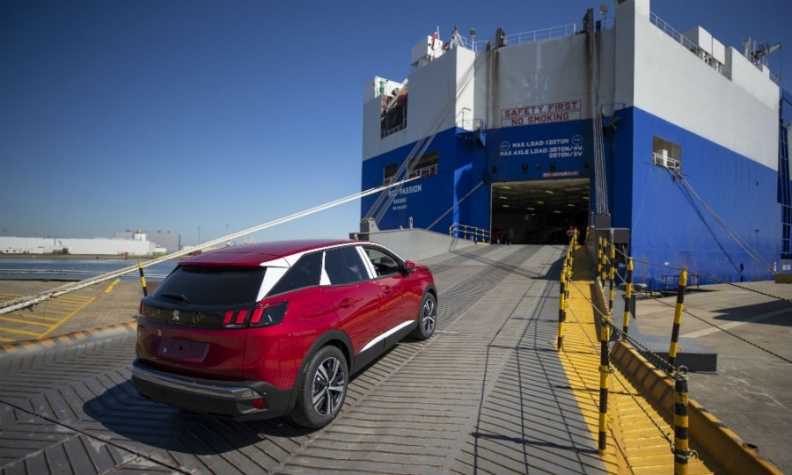 A new right hand drive Peugeot 3008 is loaded onto a vehicle carrier at Zeebrugge before export to Sheerness, England. With Brexit due in 10 months, Zeebrugge embodies the repeated warnings that Brexit is a lose-lose move. After the Pride of York ferry sailed into the Belgian port of Zeebrugge from Hull in England earlier this month, dozens of cargo containers were offloaded and whisked away on trucks. The hundreds of passengers weren't as lucky: They had to line up for border checks. Brexit risks putting UK freight in the slow lane as well. "Everybody goes through passport control," Els Creyf, duty manager at the P&O Ferries terminal in Zeebrugge, said as she stood alongside the 32-ton vessel that had made the overnight voyage. "Cargo has no controls." For now. The UK is part of the European Union's single market, which ensures the free flow of goods across national borders while being outside the bloc's common travel zone. With Brexit due in 10 months, Zeebrugge embodies the repeated warnings by the UK's EU partners that its departure from the bloc is a lose-lose move by adding bureaucracy for businesses and costs for consumers. The port calls itself the world's biggest hub for shipments of new cars, is Belgium's No. 2 harbor after Antwerp and is deeply integrated with the UK economy. The threat of delays at Zeebrugge for freight shipped to and from Britain highlights the broad economic risks of Brexit, not least for the UK, half of whose trade is with the rest of the EU. "Brexit will change a lot in the way goods transfer from the continent to the UK," Joachim Coens, chief executive officer of the Port of Zeebrugge, said in its offices overlooking a drawbridge and lock. "There will be more complexity and a lot of additional barriers for trade." Britain accounts for almost half of outbound and inbound cargo shipments at Zeebrugge and about a third of car trade at the port, which ships almost 3 million new autos a year. The harbor's core businesses are container traffic and ferries carrying trailers and autos that get driven on and off the vessels. British influences pervade Zeebrugge, from local hotels that serve baked beans and tea to right-hand-drive cars manufactured by PSA Group being loaded onto a vessel headed to Sheerness east of London. This creates an emotional bond that is symbolized by a monument near the port commemorating a World War I raid by the Royal Navy against German occupying forces. UK Prime Minister Theresa May's inner cabinet is bitterly divided over what kind of customs relations it should have with the EU once the split has taken place. May is pushing for a customs partnership that Foreign Secretary Boris Johnson, a Brexit hardliner, has called "crazy" and that the EU has said needs more detail. "In a customs union, the paperwork follows the goods," said Rene van Sloten, in charge of industrial policy at the European Chemical Industry Council in Brussels. "Outside the customs union, goods follow the paperwork." Gabriel Martac offers a preview of what could befall UK-EU trade after Brexit. His truck, carrying sporting goods made in China from Zeebrugge to the nearby Belgian coastal resort of Blankenberge, was sent to the port's border-inspection area reserved for cargo from non-EU countries. There, the trailer was tested for leaks of dangerous fumes and the whole vehicle underwent an X-ray in an enclosure that might be mistaken for an oversized car wash were it not for warning signs about high radiation. "I'll have to stay an hour," Martac, who was born in Romania, said as he waited for the trailer to be aired out by a big fan after excessive fumes were detected. "It's part of the job." Two hours later, he and his truck were still stuck in the compound as a Belgian border agent cut open individual packages to check the precise contents: foam targets for archery. As at most ports in Europe, customs authorities at Zeebrugge don't inspect all cargo from non-EU countries, instead using a "risk-analysis" system that samples shipments. This approach covers roughly 1.5 percent of non-EU cargo at Zeebrugge, according to Francis Adyns, spokesman at the Belgian Finance Ministry, which oversees the country's harbor inspections. ECS European Containers, which specializes in shipping consumer goods such as mineral water, soft drinks, wines and pet foods from Zeebrugge to outlets in Britain such as Tesco and Lidl, says it will face a lot of extra paperwork from the UK's plan to leave the EU customs union. "You at least will have to announce to the customs what you are transporting in much higher detail than today," Pieter Balcaen, CEO of ECS, said at the company's main offices. "Even if a shipment isn't singled out for inspection, you will still need to provide all the necessary data to do a risk assessment. Now we can say, for instance, it's foodstuffs or another general cargo classification and get away with it." In another section of the port, ECS unit 2XL operates a high-tech warehouse in which driverless trucks in near-continuous motion carry pallets of goods bound for Britain to and from a network of conveyor belts and storage locations. Vanessa Wanquet, a quality coordinator at 2XL, said she is preparing an application for an international standards certificate known as an Authorised Economic Operator. It's meant to simplify extra controls the company will have to deal with once Britain goes its own way. "AEO is certainly very important for us considering Brexit," Wanquet said on the warehouse floor as the driverless trucks stopped and turned in a fashion that vaguely recalled the R2-D2 character from the Star Wars movie series. "Now it's very easy, very smooth, to ship to the UK. The certificate will help reduce the additional burdens." Coens, the Zeebrugge port chief, said the whole European supply-chain industry is awaiting more clarity on the UK's post-Brexit ties to the EU and he urged the negotiators in London and Brussels to provide answers quickly. "The most important problem today is that we cannot really start preparing fully," Coens said. "We want to start as soon as possible."